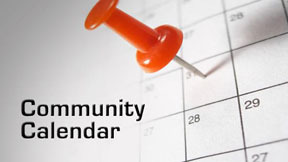 Welcome to the Dover Community Events Calendar. Should your Organization wish to have an Event posted on this calendar, your Organization must first register to be approved at least two (2) weeks prior to requesting to post an event. To Register your Organization, please download, complete and submit your Registration to the office of the Town Adminstrator at 37 N. Sussex St., Dover NJ. Once your Organization is approved, you will be notified and you may click the link below the calendar to submit an Event Posting Request. CLICK HERE to download the Organization Registration Form.